Polish death metal legends, VADER, have announced they will be invading The U.S. In May! The band will make an appearance at Maryland Death Fest on May 26th before meeting up with the package. The trek will stop in New Orleans, San Diego, and Chicago, before concluding at the Webster Hall in New York city on June 16th! Joining VADER on the 21-date tour are INTERNAL BLEEDING, SACRIFICIAL SLAUGHTER, VOICES OF RUIN, and MICAWBER. Following the tour, VADER will continue onto San Juan, Puerto Rico to play at La Respuesta on June 17th! VADER's Piotr states: "Vadermaniax !!!! Good news right after 2017 began: VADER strikes back to the USA again! We’re gonna visit 23 places across the continent starting with famous Maryland Death Fest in May 26th, where we’ll play a very special set. Dates and details are coming soon. We all can’t wait to see You again! 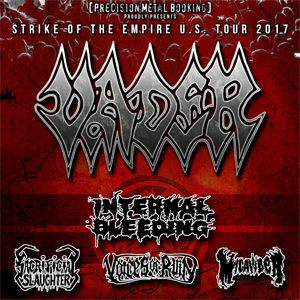 \m/ \m/"
VADER will be touring in support of their recent release, The Empire, that once again proved that their merciless riffs are made to unleash hell. Check out the track video for the song "Parabellum" on the Nuclear Blast YouTube channel!